The rallying cry at the library this year is: New Year, New You. We are having programs, displays, and lots of books and videos to get you started on a new improved you. The first program is Healthy Eating and the Better Homes and Gardens Big Book of Healthy Family Dinners is available to help the whole family eat better. Another one I like is Appetite for Life: The Thumbs Up, No Yucks Guide to Getting your Kid to be a Great Eater by Stacey Antine. My kids are grown but I still remember how hard it was to get them to take the time to eat a healthy breakfast and to eat their vegetables without giving them to the dog under the table. The next program is Active You and we have lots of books on exercise, yoga, walking, running, etc. 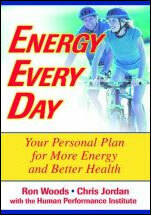 Energy Every Day by Ron Woods is a favorite of mine. We all know that if we eat well and exercise every day, we will have more energy but it’s hard to do. This book might give you the incentive you need! The next program is called Spiritual You – Richard Warren who wrote The Purpose Driven Life: What on Earth am I Here for? has been on TV a lot lately and that always makes a book popular. Another is Following the Path The Search for a Life of Passion, Purpose and Joy by Joan Chittister. The last program is Creative You and we have lots of books on crafts, how to do everything you can think of, from making furniture to sewing, knitting, or even making robots, if that’s where your heart leads. Stop by our second floor display at Steele and check out our calendar of events for program details. This entry was posted in Programs, Recommendations, Uncategorized and tagged health, new year's resolutions, recommendations by ccld. Bookmark the permalink.